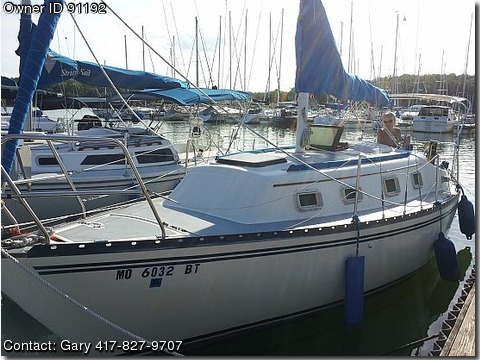 BOAT OWNER'S NOTES: This 1980 Hunter sailboat (named Really !) is 27’ long & 9’ 4” wide & weighs approx 7000#. Inside & out, this boat shines starting w/ the beautiful hull, newly painted bottom (no blisters) and fresh stripes , you release the lifelines & step onto the new non-skid deck you note the boat barely moves because of the lead weighted keel, just what you need during a blow. The pedestal helm includes compass & depth finder & water temperature, glass holders & fold down cockpit table. Remote controls for the 1992 Mercury 9.9 hp are handy to starboard. The motor has new electronics, coils & and a thorough exhaust cleaning, start easy runs great. Release the rear lifeline, flip the ladder into the H2O & step onto the comfortable 4” wide Teak steps (round SS rungs hurt). Above the helm the folding Bimini protects from the burning sun or rain. Large lazzerette to starboard & stern. As you enter the open water you leave the helm you go to the bow pulpit & check the rail mounted Danfoth anchor w/ 40’ of vinyl covered chain & 150’ of rode. Then remove the main sail cover, wrap the halyard on the Lewmar winch and raise the Schurr mainsail w/Plastream battens , adjust the traveler w/New Schaffer blocks while the main fills and you sheet her in. You adjust the blocks on the rail, release the Furled 135% sail with new Sacrificial strip, wrap the sheets and your heeling & pounding to windward. Both sails in good shape. As you step down into the main salon, you will immediately notice the traditional warmth of beautiful teak and updated neutral upholstery. With the bulk head table stowed upright, the main salon is very open. With the dining table down, it seats six comfortably. The starboard galley includes a two burner alcohol stove, a top loaded ice box, stainless sink and loads of storage. Port, over- sized rear quarter berth. The navigation station with lower storage and flip up side board, AM/FM/CD and two speakers. Plenty of storage above each settee. Electrical panels above and below Nav. Moving forward w/6’1” headroom you note the porta potti & hanging closet to starboard & sink & storage to port. Next slide the door open and the v-berth w/6’ 5” length is shown w/ storage shelves on both sides. Gel batteries (2) w/charger supply ample power & 25’ shore power cord supplies 3 duplex 110 plugs when at the dock. Bilge is accessed through Teak/Holly sole, to check Bilge Pump. At night, LED lighting provides cockpit light, without affecting night vision. Really ! is ready to perform & accommodate her new owners for many years.